Hey guys! A few quick things to let you know about if you haven’t heard yet…. 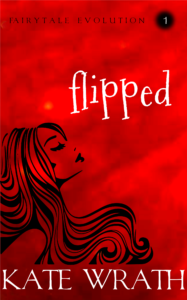 The giveaway for the one-of-a-kind art book edition of Flipped is up and running. Enter here. Sadly, the cover was destroyed (if you get my newsletter, you know all about that), but no worries! I’m making a new cover and I’m sure it will be even better. Due to the… um… devastation… of the first cover, there is a slight delay in the video footage of its making. But if you haven’t seen it yet, check out the first video, which will give you a hint of what’s in store (it’s awesome). Trust me. You want this book. So go enter the giveaway and support gnomes’ rights. Yeah, btw, I’m getting really involved in this social cause– Equal Rights for Gnomes. I hope you’ll join with me! And you can still preorder Flipped for $2.99 on Amazon. The price will go up after release on November 3rd, so best grab a copy now. Plus, it’ll give you time to read some before the release party on Saturday! That’s the main scoop! Let me know if you have any questions. I hope to see you all on Facebook on Saturday! Woot! It’s almost here! 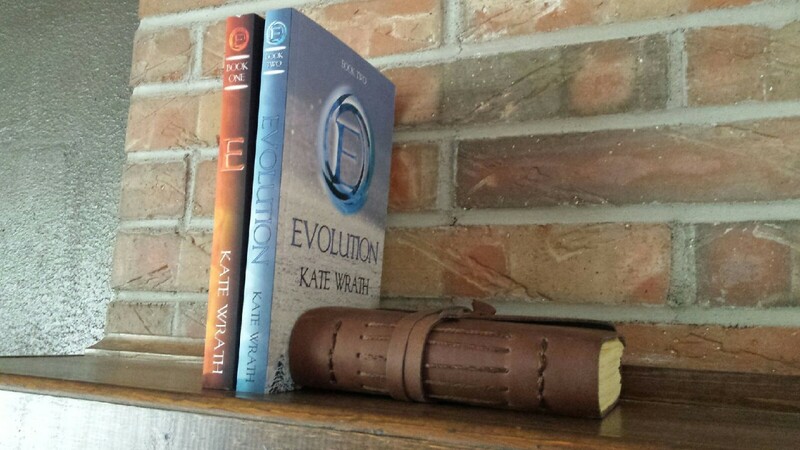 After some discussion with my editor, we’ve agreed on a release date for Fairytale Evolution Book One: Flipped. The book will be released on November 3rd, 2016. That’s only a month away! I’m soooo pleased to report that Pol has given this book his stamp of approval. To quote, “Would you be offended if I told you I liked this book better than E?” I wasn’t offended at all. Now I’m just holding my breath and hoping that you all will enjoy it as much as he has. This past few weeks has been… well… a nightmare. Almost three weeks ago, I finished writing Endgame. The following morning, I received a call with news that my dad was incredibly ill. They thought he was going to die. Needless to say, we dropped everything to be with him. And so began the long stretch of sitting at the bedside, trying to be brave, and putting everything else on the back burner. We are incredibly lucky in that, so far, my dad has pulled through. The last span of days has been a roller-coaster ride of good days and bad days, with never any certainty or ending point on the horizon. It looks like we’re in for a long battle, and I’m OK with that, considering the alternative. There are very few things in the world that can make me so casually set aside my writing and not even look at it. This is one of them. I’ve always been Daddy’s girl, and, though we’ve been dealing with health issues for years and I’ve been trying to prepare myself for losing him for years, I am simply not prepared, and I never will be. Since I got that call, I have literally gotten nothing done. At one point, several days in, sitting there while he slept, I attempted to do some read-through and revising on my phone. I just kept reading and reading the same thing and I’m not sure that any of it made it through to my brain. It was pointless. Now, with things looking a bit better– he’s “stable”, but frail– I’m trying to get back to normal life. At least somewhat. We’ve managed to do some normal things like buy groceries (major victory) and get some sleep. I’m sure many of you have been through these kinds of family crises and know how it goes. I’m still devoting a lot of time and energy to Dad, which means that there’s not a lot left for editing and revising. And honestly, the revision phase of writing is always difficult and energy-draining for me, unlike the writing phase, which usually recharges me. I’m already exhausted, mentally and physically. So this last haul will be difficult, and it will likely take longer than it would have otherwise. And then subtract the three weeks that was just sucked into the vacuum of life. So what this all adds up to, as I’m sure you could have guessed after reading the title of this post, is that Endgame will be arriving later than expected. I’ve had emails and blog comments (that I still need to reply to) asking me when Endgame would be released, and generally sharing excitement and enthusiasm over the coming release. I love receiving those and they really help motivate me. It makes me so sad to have to announce a delay because I know you’ve all been waiting for this book. And I’m as excited as you are about finishing the series. Also, I don’t feel like I can give you an exact answer at this point. I am planning on putting everything I can muster into finishing this book. I’m a driven person, so usually I would go on that alone and have a decent amount of confidence about a time frame. Only, in this case, I’m still living in anything-can-happen-land. The only honest answer is that I don’t know, but I’m going to try like crazy to keep the delay from being longer than necessary. Most likely, I think we’re looking at a matter of weeks, rather than months. And yeah, typing that, it sounds like a long time. All I can say is… I’m sorry. 🙁 I’ll do my best to post updates on Facebook, etc. I am going to send this out in a newsletter as well, so if you’re subscribed to both blog and mailing list, please forgive the duplicate post. The Elegy Launch Day Party will take place tomorrow night (Monday, Nov. 23,) at 8-12 pm Eastern on Facebook. Click here to go to the party. Come and hang out if you can. We always have tons of fun. Check out How to Make a Brain Hemorrhage by Zeke on Snapguide. Elegy is LIVE one day early. If you just can’t wait to get your copy, Elegy is available a little sooner than expected. You can follow my affiliate link below, or you can do a search on Amazon. Enjoy reading! I hope you are all having a great weekend! Woohoo! It’s finally here! I’m so incredibly delighted to be sharing yet another book with you. I loved every minute of writing Eden, and I hope that you’ll love this story as much as I do. The new covers are now in print! 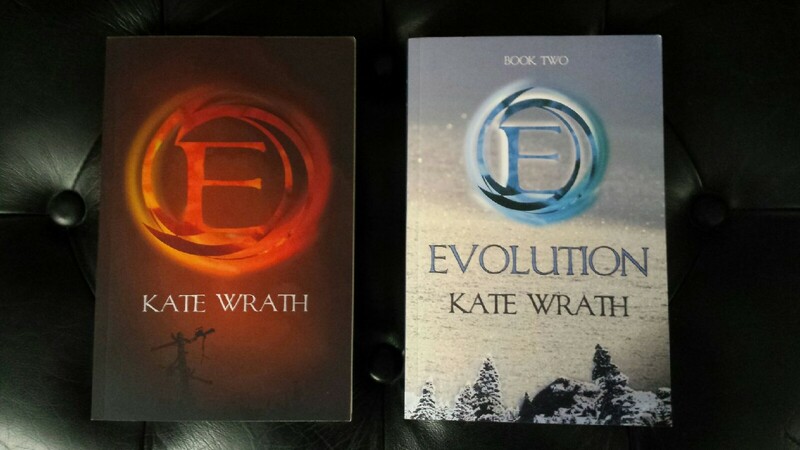 My proofs of E and Evolution with the new covers arrived in the mail today. They look pretty good, if I do say so myself! So yeah, I’ve approved them for sale and they are up on Createspace now. They should be on Amazon within the week. I got all excited about it and took a bunch of pictures. Check ’em out. I’m sure these updates are getting a little boring, but I’m stilllllllllll editing. This is probably the most tedious part of writing a book, but it is so important. I want the next book to be as good as it can be when it hits the shelves. There are always lots of loose bits that need to be tightened up, and things that amuse me, the writer, but apparently amuse no one else…. Those have to be dealt with. I also tend to understate things at times, and my editor always catches me on those and demands I rewrite them properly. :p I’ve just gotten back a rewrite of the first section of the book with a note that says “BETTER”. I had to ask what “BETTER” meant, specifically, and apparently it translates to a pass… however I still feel I would like to make some changes, so I think I’m going to have another look at it. First I’m going to finish my rewrite of the next section so that my editor can get on with that. We’re coming up on deadline quickly, and I am determined to release in November at the latest. The world outside of Outpost Three. More of the characters you love, and some new ones. E is available in print! As promised, E is now available in print! I received my proof a couple of days early, and everything looks good. I’ve gone ahead and approved it for sale. So… if you have been waiting for the print version of E, you can now get it. 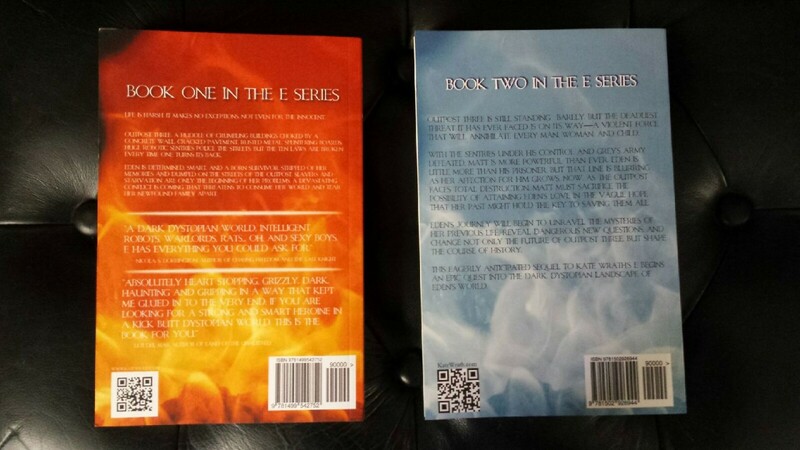 E is available in the Createspace eStore for $8.99 (plus shipping) as of now. Within 3-5 days, the print version will also be on Amazon. International pricing is comparable. I’ve tried to keep the print pricing down as much as possible. In order to do this, I have forgone placing E in some expanded distribution channels that would allow me to market to libraries, bookstores, and so on (because doing so raises the print costs). This is for the time being, and I will be adding E to those sales channels eventually, which will increase the price by a few dollars, FYI. Meanwhile, I have started my first edit of TMT, and I have also done some more writing of the rough draft of the prequel, which may be my favorite book yet! TMT is written! 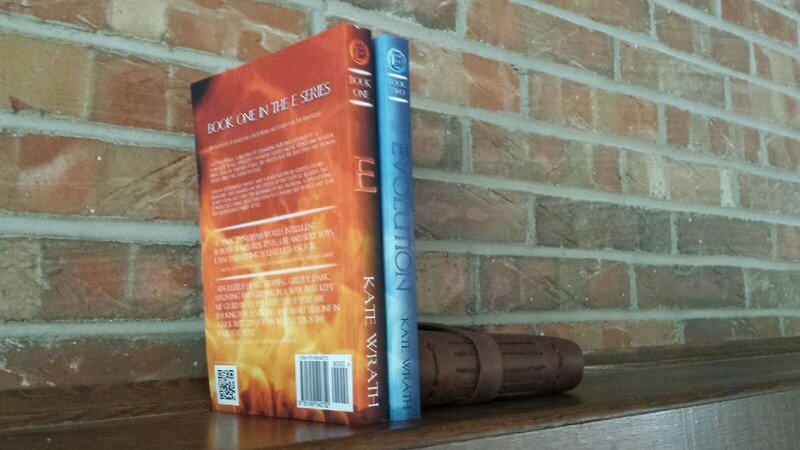 And, the launch of a new Indie site, Rock the Book! TMT, round 1, is done! So aside from all that, I have some more super-exciting news. I have banded together with fellow Indie writers Nicola S. Dorrington (you’ve seen her author interview on my Extras page, I hope) and Leti Del Mar to create a new blog just for Indie authors and the people who love them. The blog is called Rock the Book, and will be packed full of articles and resources for Indie authors. 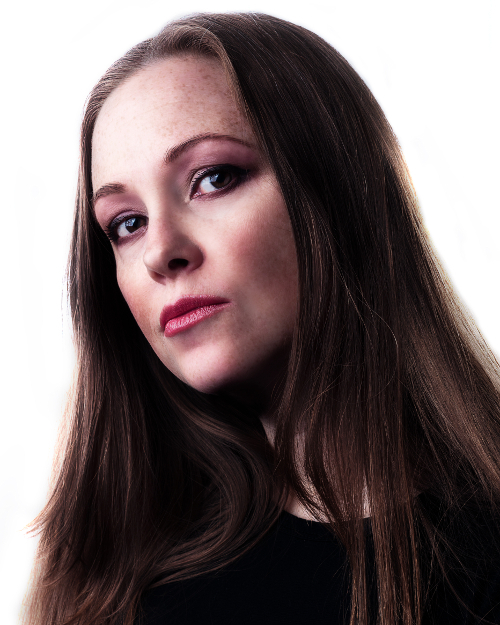 We will be doing Indie book reviews, author spotlights and interviews, and much, much more. This site is geared toward helping out the Indie community. Everything is free, so you won’t find any hidden give-us-money schemes. So, today is launch day! Stop on by and leave a comment, or sign up to follow. If you are an Indie author, don’t hesitate to sign up for an interview, spotlight, or book review. These will be filling up fast so get on board now! 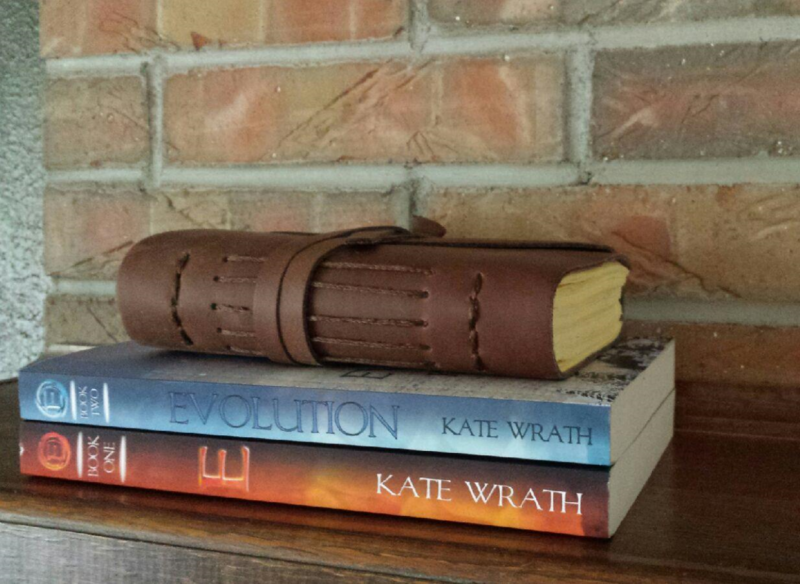 If you’re a blogger or book reviewer, consider helping us by writing a guest review. We are also open for guest posts, so if you have some fabulous content you’d like to share, please let us know. There are forms on the site you can fill out for pretty much all of these. If you don’t find a form for it, just give us a shout through email. If you’re a reader, please stop on by and show your support for Indie authors. You’ll be able to find out about new books, learn about the writing/publishing process, and connect with authors. Everyone is also invited to participate in our Think Tanks. Just make sure you sign up– we’ll need your email– and then you will automatically be included in group interviews and hot topic conversations that will be posted to the site. Please share this with all the Indie authors and readers you know. And follow @RTBIndie on Twitter. Grab it now on Kindle: Your free copy of E. Come on. You know you want to. My free promotion has begun and will run through Sunday, May 11th. It’s brand new, and this is just the beginning, folks. I would love, love, love to hear what you think!